The Australian Institute of Packaging (AIP) will not only be exhibiting for the third consecutive year in the Australian Pavilion at ProPak Asia 2019 but will also be launching the inaugural Global Packaging Forum and running a Sustainable Packaging Design Training course alongside the show for all of industry to attend. 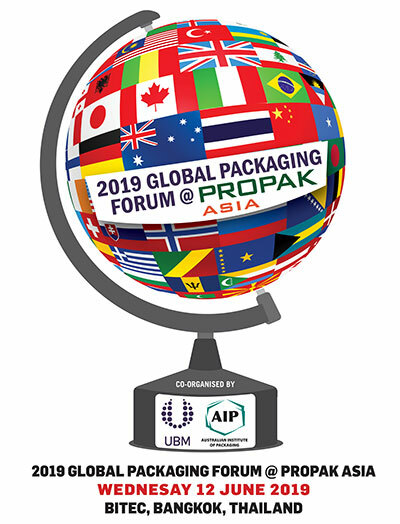 The Australian Institute of Packaging (AIP), in conjunction with UBM Allworld, will be running the inaugural Global Packaging Forum on the 12th of June @ ProPak Asia 2019. Speakers will be coming from all across the globe to discuss regional and global trends in Sustainable Packaging, Biodegradable and Compostable Packaging, 2025 Sustainable Packaging Targets, how the industry can help minimise Food Waste, Save Food Packaging Design, Regional and Global Trends in packaging, innovation, digital printing, robotics & automation and more. The speakers will come from both key global packaging associations and leading companies in these markets. The AIP will also be running their new ‘Introduction to Sustainable Packaging Design Training Course on the 14th for all of industry to attend. Known as Asia’s number one packaging and processing exhibition ProPak Asia 2019 will be held from the 12 to 15th of June in Bangkok, Thailand. ProPak Asia has been serving the ASEAN Region for 27 years and is the regional hub for connecting packaging and processing manufacturers and suppliers. ProPak Asia 2019 will showcase over 20,000 products and solutions across 1900 exhibitors from 50 countries within 9 zones over 4 days. ProPak Asia is divided into nine targeted zones for visitors including ProcessingTechAsia, PackagingTechAsia, DrinkTechAsia, PharmaTechAsia, Lab&TestAsia, Materials Asia, Coding, Marking & Labelling Asia, Coldchain, Logistics & Warehousing Asia and Printech Asia.